As a business the team at Mashbo loves being recognised for doing great work, there’s nothing better. Except, that is, being recognised for work that is changing lives. 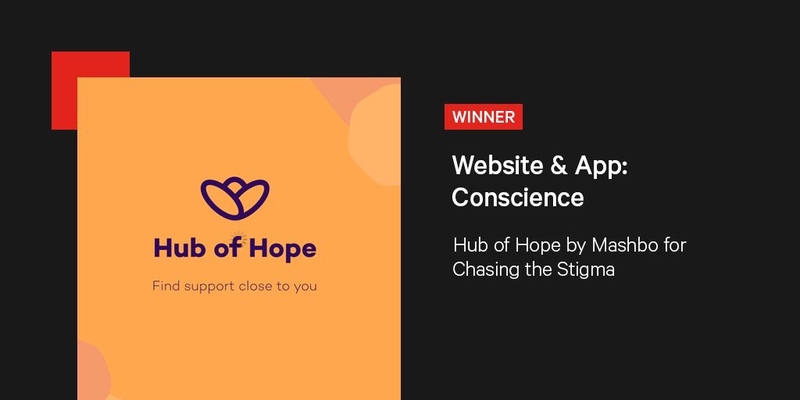 Last night (Thursday 13th September), our joint venture with national mental health charity, Chasing the Stigma, mental health support app the Hub of Hope, was awarded the ‘Website & Apps with Conscience’ accolade at the BIMA Awards ceremony. The Hub of Hope faced tough competition in the category, coming up against the British National Formulary (BNF) app and Transport for Greater Manchester (TfGM) website redesign. If you’re not familiar with them, the BIMA awards celebrate British digital work that is pushing the limits across innovation, craft and impact, as well as making a difference in business, culture and society. The category in which we were nominated specifically champions the effective application of digital expertise to deliver positive social impact. The Hub of Hope is certainly doing that. Since its launch in July 2017 the app has helped 19,000 people seeking support for a wide range of mental health issues. Using location-based technology it has signposted them to the nearest and most relevant source of help from its database of more than 1,200 organisations. It is the UK’s most comprehensive mental health support database and the first to ever bring local, grassroots and national services together in one place. Its ease of use has led to its adoption as a signposting tool by phone advisors on Papyrus’ Hopeline, as part of the Zero Suicide Alliance’s acclaimed ‘See Say Signpost’ training and by emergency services across the country, as well as being endorsed by more than 25 national mental health organisations. The Hub of Hope is a project that is incredibly close to the hearts of the whole team at Mashbo. We all have our own experience of mental health issues - either personally or with that of loved ones - and we know just how vital the app can be. Working with the team at Chasing the Stigma has been a honour. We have combined the charity’s expertise with Mashbo’s technical and consultancy skills to create a solution that has a positive social impact. But this is only the beginning, there’s so much more that we can do and we can make even more of a difference. Winning this award is most important because it gives the charity and app a platform. it provides a chance to urge people to download the Hub of Hope app and use it to find support when they need it, whether it’s from themselves or someone else. It reminds mental health support services large and small to register so they can be found more easily. The Hub of Hope has been shortlisted for a fantastic award and we need your help!